Please click here to purchase this product. The Memory Management System (MMS) was developed with the commercial user in mind. Meaning, MMS was engineered to be running 24 hours a day 7 days a week with no user intervention needed. We have a version of MMS integrated into our commercial software called KeepAlive Pro. We at PB Software specialize in software that prevents long term software failures. We make the current software that you are running more reliable by monitoring applications and system resources and taking action. There are a lot of applications out today that need user input because the necessary intelligence needed to make informed decisions are not built in. MMS monitors the "Health" of your server or PCs memory, and makes quantified decisions based on your hardware and software needs. MMS is engineered to be installed and to forget about it. Memory is where your server or computer stores the information while it is running. The system memory is the place where the computer holds current programs and data that are in use. The amount of memory you have is an important contributing factor to overall performance. In many ways, it is more important than the processor, because insufficient memory can cause a processor to work at 50% or even more below its performance potential. This is an important piece of information that is often overlooked when evaluating the performance of computer systems. Hard disks are almost a hundred times slower than memory and this is one of the reasons why it is important to have MMS installed, to continuously recover memory that is lost over time. Do I need MMS if I have a powerful computer? If you have a powerful computer running any amount of applications the answer is definitely! There is a misconception out there that usually sounds like this, if I have a lot of free memory then my computer will run faster. This is only if your computer does not run out of memory! If it does run out of memory, then your computer will slow down, and will use your hard disk as "virtual memory." Again, your hard drive is hundreds of times slower than your memory. Programs have that have "memory leaks" waste the computer memory and never release it. Over time, if the Pc or server is left running, the memory will be used up slowly and continuosly. MMS maintains the necessary memory needed for your computer to run efficiently. Of course, this statement takes into consideration that your computer has enough memory installed to efficiently run your computer in the first place. A good guide to know if you have enough memory installed, is to look at your applications specifications, and your operating systems specifications and make the determination from that information. What makes MMS different from the rest? Simple, with the development of "Smart Technology" we have been able to intelligently release appropriate amounts of memory based on your computers parameters. There are many programs out there now that can release memory and have so many settings it will make your head spin. 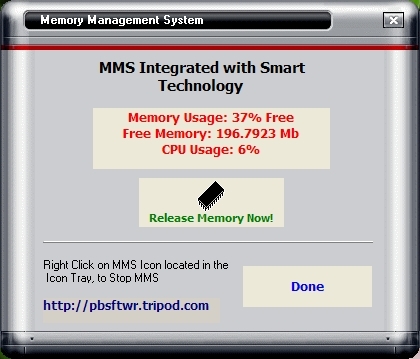 By using "Smart Technology" MMS can run on your computer without any user intervention needed. MMS makes an informed decision on the amount of memory that is released. It is very important not to release too much memory because that will crash many programs. "Smart Technology" takes into account all of those variables and then releases enough memory for your computer to run as efficiently as possible. We have given you the user the ability to forcefully free memory. This can be done by double-clicking on the icon with the chip and lightning bolt through it. We did this because you may want to start a program that you know takes up an incredible amount of memory and may want to start with as much free memory as possible, before launching the program. We understand that this is not the norm, however, we wanted to give the user some control to free the memory if the need existed. How do I use MMS? Simple, install it, reboot your computer, and your done! MMS will do the rest. The beauty of MMS is the ability to run transparently like its not even there. There are of course functions that may appeal to you. If you want to know how much free memory that your computer currently has, just place your cursor over the icon. The icon should appear on the bottom right hand side of your computer in your icon tray. If you want to exit from MMS, just right mouse click on this icon and you may stop MMS. If you would like to see in a graphical display indicating how much free memory you have, double-click on this icon and this dialog box should appear. From the dialog box the user can "Forcefully Free RAM" or just look at the amount of free memory available. That is all! Everything else has been done for you!